Today while out to lunch Luke discovered ketchup. I met Mom and the kids for lunch today at Wendy's. While there Luke ate his typical lunch of plain cheese burger and fries. 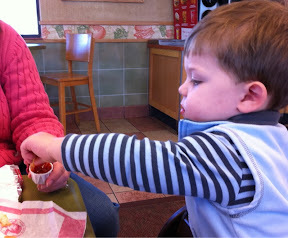 Then in an act of emulation he grabbed a french fry, dunked it it ketchup, and ate it. From that point on he'd have nothing to do with plain fries and would only accept ketchup ones. He would also try and get every single bite ketchupy even if he was down to a nub and got his fingers all yucky. I can't blame him for being a big fan. Up to this point he has led a very plain life when it comes to food.